Here are my responses to the most frequently asked six questions from people who watched our videos on elevated corridors. Please feel free to add your points so we can strengthen the argument and keep it to the merits of the case without getting personal, no matter what the others say. Q1: What is the problem with elevated roads? Why do you oppose it? A: The problem with elevated roads is that they are built for private vehicles. Bikes & cars carry people very inefficiently. When a city is small, with lower population & lower vehicular density, it may not hurt. With 1.3 cr people and 75 lakh privates vehicles and *1500 NEW PRIVATE VEHICLES* registered *DAILY*, no amount of roads and elevated corridors can solve the problem. Before you finish building it in 3-5-10 years, the number of vehicles will have multiplied and congestion will be worse. Pollution terrible. Utmost 4 can go in a car. A single bus can take upto 40 bikes+cars equivalents. Suburban train can carry 20-25 lakhs. Metro 5-10 lakhs. After doing all this, if needed, we can construct elevated roads. Q2: Aren’t elevated roads useful to travel from one end of the city to all the way to other end? Won’t they speed up travel? A: Long distance commute happens very well in trains and metro. With bus rapid transit dedicated lanes & priority signalling, buses can be made faster. The ask is to first invest in mass transit like the suburban train, Metro & buses. Use that 33,000 crore + 152 acres + all the governmental focus, time & effort on public transport instead of the elevated corridor. After mass transit is fully built out, then low efficiency, high cost and polluting infrastructure like flyovers can be examined as needed. Q3: We already have 6500 buses. If we add more or double it, won’t it create more congestion? Where is the space? A: RTO data widely published shows that 1500 new private vehicles are registered daily. DAILY. This has been going on for a year now! That’s equivalent to at least 20-30 new buses DAILY. In a month, it will come to at least 500-750 additional buses on the road! If fast lanes are reserved for buses on arterial roads like ORR, Sarjapur, OMR etc., and ticket prices are reduced, thousands of private vehicles will get off the road! Secondly, transport data also shows that public buses occupy 0.3% road space in Bengaluru! The cause of commotion is private vehicles. We need to invest in ubiquitous, fast, cheap and friendly mass transit and incentivise people to use it. The same way that people do in London/NYC/Paris etc. Q4: Different people have different preferences & schedules.. You can not expect a company CEO to travel on a bus, why expect only IT employees to comply? Why do you enforce transport mode on people? A: That is correct, we cannot enforce transport modes on people. What we can do is to emulate numerous cities that have made these mistakes, learned and are now moving away from private vehicle based solutions. They are dismantling flyovers, making buses free and increasing train coverage. We can invest massively – the same 33,000 crores – in ubiquitous, fast, cheap and friendly mass transit and we can incentivise people to use it. We can increase taxes on private vehicles and and assign slow lanes to them on roads except when carpooling. We can charge for parking. The same way that people do in London/NYC/Paris etc are doing it and, the same way our own people use public transport in those cities. This won’t force but encourage people to voluntarily shift to mass transit due to it being faster/cheaper and more convenient. No one wants to drive if they can avoid it – it is a chore. Even the PM/premiers of Western European rich countries travel by cycles and trains. It is very much possible if we create the right system and infrastructure to enable that. Q5: It is now fashionable for some people to poke their noses into each and every action of GoK. Instead of asking for what we want we are campaigning to stop something which may not be useful for us but definitely useful to some other people. GoK can’t find solutions separately for each and everyone, right? A: The GoK certainly cannot cater to every single demand. That is the very reason we are advocating due process as per the law, not any special treatment for any section of people. The Metropolitan Planning Committee is responsible for the Master Plan, which does not mention this massive project. No feasibility study or plan have been conducted and/or made public which is mandatory before announcing a budget and land acquisition for it! Without this 33,000 cr with 152 acres of land acquisition have been announced. Our demand is for a public consultation for all, not special audience to us. Also, mass transit like suburban train can carry 10-20 lakhs of people with 1/2 that investment, and complete in a fraction of the time with little or no disturbance to the city during construction bt it has only been allocated 350 crores! Similarly buses received only 100 cr in this budget while they execute 50 lakh trips daily & get can thousands of vehicles off the road in short order! We are fighting for mass public transit – that is our demand. Since there is nearly no budget or focus on that from GoK. As the name indicates, mass public transport is for tens of lakhs of people. Not the few car owners. Car owners need to, for a second, imagine what it is to be a low income earner, who can barely afford public transport that is poorly connected, not interchangeable, and yet having to commute in rain & shine with bags in hand. 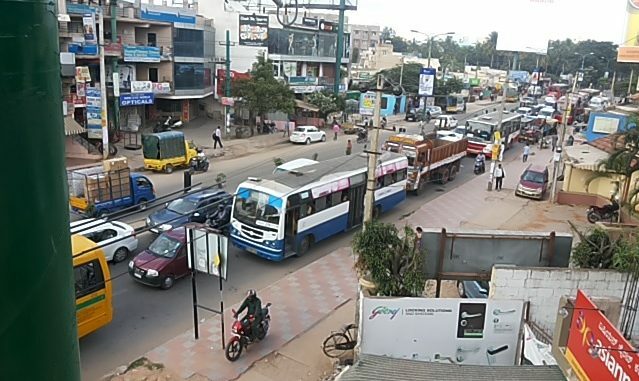 Bengaluru has 1.3 cr people – we need to multiple modes of ubiquitous, fast, cheap, interconnected & comfortable mass transit. Q6: We elected GoK & they know how to manage the city; give them freedom, let them decide. Why do you people interfere? A: If GoK knew how to manage the city, Bengaluru wouldn’t be in this mess. No matter who the forms government, we have too much traffic, congestion, burning lakes, garbage dumps, sewerage & water mixing, flooding with rains, pothole deaths. In fairness, these issues are complex, no small set of people in government can be expected to have all the answers. They need help, their approach of prioritising private vehicles needs to change. It is unscalable. Most importantly, eternal vigilance is the price of democracy. It is our job, nay duty, in a democratic republic to engage with government – provide input, feedback and oppose if needed. Spot On! You are absolutely right madame. People have a tendency to look for quick solutions & elevated roads may seem like an obvious choice. However, such elevated roads have made a complete mess out of cities like Los Angeles & Bangkok, both of which are facing terrible congestion levels (Bangkok has the 2nd worst congestion levels in the whole world after Mexico city). Let’s remember that no city has ever built itself out of the congestion problem. No city can ever build its way out of congestion in future either. The more you build, the worse it gets is a sort of thumb rule, going by worldwide experiences. Elevated roads will mess up Bangalore very badly. The tendency to resort to private modes of commuting will be too strong a temptation for most & this in turn will invite more road traffic – which will require more roads in a vicious never ending cycle. The only solution for Bangalore (or any city facing congestion issues) is to expand metro rail substantially & introduce suburban rail. Road expansions must be completely halted until a full & extensive mass transit system is in place. It is strange that the govt has canceled two vital routes prepared earlier by BMRC for metro’s phase-3. These are the Yelahanka-Karmelaram & Hosakerehalli-Varthur routes. It isn’t any coincidence that these routes overlap with their plan for elevated roads & pod taxis (another equally useless project). These two metro routes need to be reinstated in phase-3 instead of planning meaningless metro extensions outside the city that is of little value for commuters. Chasing costly & senseless elevated roads in the hope of relieving congestion is going to take congestion levels to much higher levels in the city for sure!